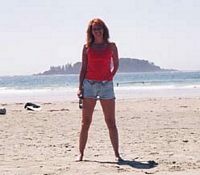 My name is Sharlene and Lost Trekkers is my website. Thanks for stopping by! I built Lost Trekkers because I wanted to be able to use my skills (website/marketing stuff) in a way that would help people. I was previously employed in the corporate world and found that it was not for me, so there in my cubical the idea for Lost Trekkers was born; 2 years and 6 billion cups of coffee later the site went live. My goal was to create a user friendly site that could be searched quickly, was easy to read and did not require registration in order to search. The site is totally free of charge, I wanted to ensure that everyone regardless of their financial situation could find and reconnect with the people they were looking for. That being said, a gals gotta eat so there is some advertising on the site but all of the information is free and none of the sites I have linked to require you to register in order to get information. The ads are there if you are interested, if not they will not interfere with searching or placing ads (no pop ups or other in your face annoying ads). I hope that you like the site and enjoyed your time on it. If you have any comments or suggestions you would like to share I would love to hear them. So far visitors from 185 countries have stopped by. Thanks for visiting. Want to advertise on Lost Trekkers? Do you run a people locator, travel, tourism, community or social website? We are currently offering text/image buttons (125x125) advertising on the Country Specific web pages - right side - beside ad content.. More options will be added; if you are interested in another space on the site let us know and we will see if it works for the site. Flat rate monthly fee pricing. We will not accept advertising from your direct competitors when you advertise directly with us (on our system), we do run AdSense ads which may run your competitors ads. For more information email us with a url to your site and your advertising requirements and we will provide site statistics and let you know if we can do it and for how much.